Any physician will tell you that exercise is the key to a long and healthy life. Many people use cycling as an exercise to stay in good health. As a matter of fact, the battery doctor agrees, cycling is good and the same is true for the batteries in your UPS units too! The batteries in the UPS are Sealed Lead Acid (SLA). The electrolytic reaction between the acid and the lead produce electricity that is used by the UPS in the case of a power outage. However, there is a down side to this chemical reaction called Sulfation. As time goes by, and the battery is not used, some of the sulphates from the sulphuric acid electrolyte solution will precipitate, or fall out of the solution. This deposits a white powdery substance on the plates of lead in the battery. Once covered in this sulfur layer, the efficiency of the unit is greatly degraded. If enough sulfation occurs the acid can no longer make contact with the lead and the battery can no longer produce electricity. The best thing you can do to reduce the effects of sulfation is simply cycle the UPS every so often ! Discharging and recharging a SLA battery is called cycling and periodic cycling of the batteries can remove problematic sulphate deposits from the plates If the batteries are regularly exercised, the build-up of sulfates is minimized and the battery life is extended. 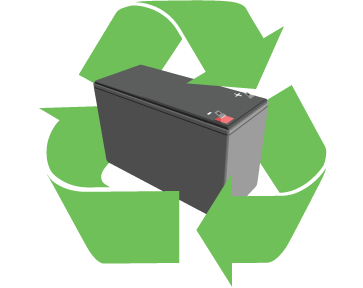 As part of your planned UPS maintenance regimen, once per quarter, you should cycle your batteries. Of course, save any critical data before initiating the cycle, and/or attach mission critical components to redundant power feeds for safety. Next, cut the power to your UPS by simply unplugging it. Let the UPS run on battery until your charge indicator reads 60% charge. As the battery discharges, it heats up, and the sulphates will release from the plates, exposing good conductive surfaces. These simple steps will ensure that you get the most out of your SLA batteries, however even with proper cycling, most SLA applications will require replacement about every 2 to 3 years to maintain maximum performance. Because of this, we recommend that you time your UPS cycle, so that you can see if the batteries have enough capacity to support your desired runtime still, since each sulfation-desufation cycle does reduce the potency of the electrolytic acid solution slightly. If your UPS runs down to 60% in less then 5 minutes, you should consider replacing your batteries or upgrading to a larger unit. You can find replacement battery kits for all major UPS manufacturers, including APC, Tripp Lite, Liebert, Powerware, and more in our Replacement Battery Center here! In addition, we carry a full line of top quality APC UPS units professionally refurbished with brand new batteries at bargain prices in our online catalog, checkout our UPS PowerBuys here!